Inspired by the California vineyards and the wine barrels that make them famous, Napa Plank porcelain tile evokes spirit of hand made floors, reclaimed from the oak used to store wine as it ages to perfection. These floors, stained by juices and time, exhibit the saw marks that skip along the surface of the wood and the uniqueness of the barrel as it is reused to make each special plank. The rugged beauty combined with the strength and durability of porcelain makes this tile a perfect fit both indoor and out, on the floor or the wall, limited only by your imagination. This tile features random variations of shade and texture within each carton. To insure optimum appearance, it is imperative that tiles from various cartons be continually blended during installation. Placement of tiles should be decided on before beginning installation. *Ceramic Tiles **OSHA (Occupational Safety and Health Administration) has established a recognized industry standard of 0.5 (wet and dry) for slipresistant surfaces. The Americans with Disabilities Act (ADA) recommends, but does not require, "a Static Coefficient of Friction of 0.60 for accessible routes and 0.80 for ramps." ADA does not specifically state that 0.60 is both a dry and a wet requirement. It is important to note that any tile or other hard surface flooring can become slippery when wet or improperly maintained. 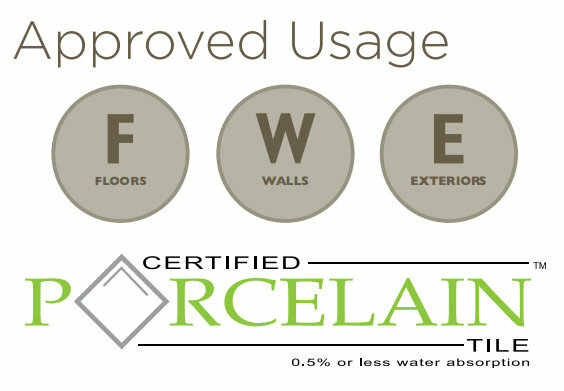 Products installed in an exterior application must comply with applicable ANSI 108 series of the "American National Standard Specifications for the Installation of Ceramic Tile" and comply with TCA installation methods applicable to installation conditions. Shaw Riche Carpet Tile 24" x 24"
Shaw Ingrain Carpet Tile 24" x 24"